Characters: Westerfeld has a grip of characters that astounds me. From the first page, you understand who Alek is based solely on that pesky concepts most writers struggle with known as Show, Don't Tell. The characters are not overwhelming in the story, but subtly creep up on the reader until they turn and say, "When did you become so awesome?" He uses patterns of speech and the societies he has built to create very absorbing and sympathetic characters. The Darwinists and the Clankers are both so well formed ideals and cultures that it makes it even more amazing when Alek (Clanker) and Deryn (Darwinist) can overcome their differences and work together. And when Deryn and Alek's stories finally cross, the interaction is heartwarning, exhillerating as well as incredibly tense. A wonderful combination. 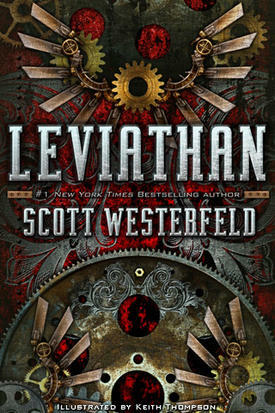 Plot: After the first few chapters, it is obvious that Westerfeld is a plot-driven writer. For the beginning of the novel, (which is primarily necessary set-up) our heroes are forced into the situations by the goings-on around them. During the second half of the book, in which the storylines of our heroes collid, and they begin to make bold decisions that have dire consequences, the plot couldn't move smoother. The tension woven into the second half of the book left me begging for more-- precisely what you want from a reader. I was, admittedly, worried when I realized the book would take place in WW1. I'm a history buff, and was pleased that despite the "alternate" history of the book, most of it was acurate. The things that were changed were purposeful. Fundementals: Can I say how much I loved the illustrations in this book? I didn't see any problems with the way the book was written, (And it was in third person too! That made me happy.) But I honestly think the illustrations gave this book the leg up that made it beyond fantastic. I'm not normally a fan of illustrations in any books above the MG level, but Keith Thompson's illustrations are breathtaking. Dropping images here, here, and here. Overall: Go buy it. It was fantastic. Whether this is your first or twelelth steampunk, it's definately worth the ride. And dropping Scott Westerfeld's blog here. And Keith Thompson's website here. And check out this book trailer too. It's awesome. I'm really looking forward to picking this up. Happy to see another great review!